Located on the River Vltava in central Bohemia, Prague (Czech: Praha), is the capital and largest city in the Czech Republic. 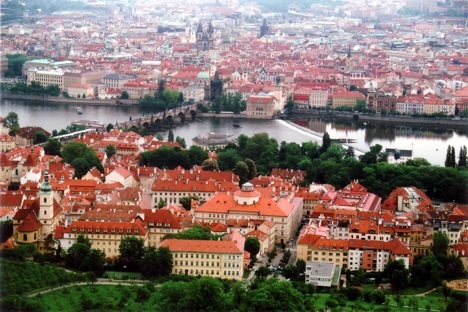 As of 2007, Prague had an estimated population of 1,194,407, with 1,941,803 living in the metropolitan area. 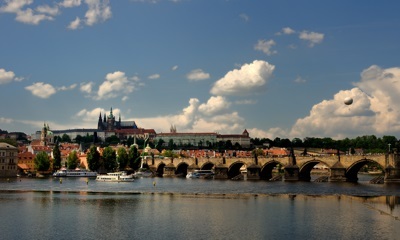 Prague is a very popular and beautiful city with many historic buildings and sites. It is from this heritage that many of Prague's nicknames are derived: "the mother of cities", "the golden city", and most especially, "city of a hundred spires". Prague suffered less damage during World War II than many other cities in central Europe, and buildings can be found in many architectural styles including Art Noveau, Baroque, Cubist, Gothic, Neo-Classical, Renaissance, as well as modern. The Astronomical Clock (Czech: Pražský orloj) - A medieval astronomical clock mountained on the southern wall of the Old Town City Hall in Old Town Square. The Charles Bridge (Czech: Karluv most) - A picturesque bridge constructed during the 14th and 15th centuries. The Lennon Wall - a historic wall which is filled with John Lennon and Beatles inspired graffiti. The Petrín lookout tower (Czech: Petrínská rozhledna) - A 195 foot (60 meter) observation tower, which resembles version of Paris' Eiffel Tower, although vastly reduced in scale. Despite its comparative small size, because the Petrín lookout tower is located at the top of a large hill, it reaches nearly the same altitude as the Eiffel Tower. Prague Castle (Czech: Pražský hrad) - which is arguably the largest castle in the world, and dates back to 870. Wenceslas Square (Czech: Václavské námestí) - The center of business and culture in Prague's New Town. Žižkov Television Tower - A large television tower on the top of a hill, with an observation deck at 325 feet (100 meters) above ground level. Sculptures of crawling babies by the Czech artist, David Cerný, were added to the tower's pillars in 2000 as a temporary installation, but made a permanent addition in 2001. As well being its history, today Prague is also a center of culture. There are many theaters, museums and galleries, and the cities hosts film, music, writers and fashion festivals and shows. Because of its culture and historical heritage, is one of the world's most popular tourist destinations, and the sixth most visited European city after London, Paris, Rome, Madrid and Berlin.